Welcome to Hi-Timers Square Dancing! 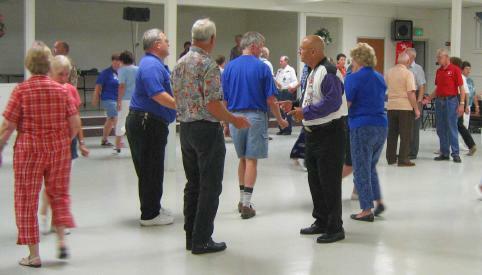 The Hi-Timers is a Modern Western Square Dance club that meets in Gahanna, Ohio, on the east side of Columbus. We dance at the Plus level, with a bit of DBD thrown in to make things interesting. Between tips we also offer round dancing. Casual attire is our norm. We dance from 7:30 to 10:00 PM on the 1st, 3rd, and 5th Wednesdays of each month at the Gahanna Community Congregational Church, 470 Havens Corners Road, just east of Hamilton Road. We usually offer a half hour of early rounds, starting at 7:00 PM. 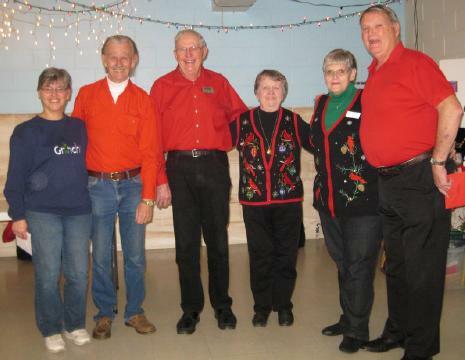 The Hi-Timers was founded in January, 2004, by Mark Clausing and Cindy Whitaker, both of Fairfield, Ohio. In January, 2018, Mark and Cindy retired as the Hi-Timers callers and turned the reigns over to Ed Laudenschlager, our current caller. Chuck Berry cues our rounds (typically phase II and III). There is a $7/person entrance fee for each dance. There are no annual membership fees. The Hi-Timers is a growing club. We welcome new members and friends. If our style of dancing interests you -- even if you don't feel you are a strong plus dancer -- please consider checking us out; we are always looking for dancers with a love of learning and an interest in improving their square dancing skills. Inclement weather? Check the COCDC website for cancellations. Central Ohio dances online: The COCDC dance calendar. Banner steals, retrieves, or other questions? Contact Debbie Kitts at 614-385-8889(H) or 614-735-2203(C). Or, if you'd prefer, feel free to contact Ed Laudenschlager.